At Girl Scouts of Colorado, we know that when given the opportunity, girls change the world, and we have the reach and experience to help girls everywhere lead. We believe when girls succeed so does society. Invest in girls, make the world a better place. Happy National Volunteer Appreciation Month! 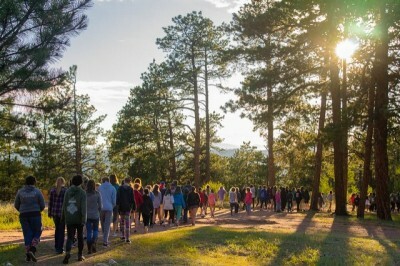 Because the work GSCO volunteers do with girls is not just for a better today but also ensures the best tomorrow, Girl Scouts of Colorado has made a donation to the Restoring Colorado’s Forest Fund in your honor. Our partnership with the Colorado State Forest Service is a perfect fit. The gift of seedling trees to be planted in areas impacted by wildfires and other natural disasters will make a difference for generations to come. Girls are first at Girl Scouts. Where your girl belongs. Girls are first at Girl Scouts. And they always will be. Girl Scouts is her home turf, her go-to place where she’s free to try new things and just be herself, no matter what her interests are. And now there’s even more to explore, with new badges in robotics, outdoor adventuring, cybersecurity, and environmental stewardship—to name just a few! Join or volunteer today, and give her the tools to shine!